Green Marketing Gets Real is a practical tool prepared by Stratos Inc. with the support of Industry Canada, to help Canadian retailers and producers of consumer products better understand, plan for, and capitalize on sustainability communication at point of purchase (POP). Based on the results of a study that investigated the practices of seven leading companies, “Green Marketing Gets Real” provides practical advice and techniques to help companies determine the “Why”, the “What” and the “How” of sustainability communication. Stratos Inc. is a leading Canadian sustainability consultancy based in Ottawa and Calgary. This tool is divided into four sections: Key Study Lessons and the WHY, the WHAT, and the HOW of sustainability communication at POP. The full study, including case studies on each participating company, can be downloaded at stratos. Putting performance before communication — Aveda, a US-based manufacturer and retailer of consumer products (beauty), ensures strong product performance in function, quality and sustainability before communicating these results to consumers. Linking product and sustainability performance — P&G, a US-based manufacturer and marketer of consumer products (personal care and household), developed Bounty “select-a-size” paper towels to reduce consumption by offering flexible sheet sizes. POP communication focuses on performance, rather than associated sustainability benefits. Simplifying sustainability communication at POP — Out of 100 corporate sustainability commitments (“Plan A”), M&S, a UK-based retailer of consumer products (apparel and food), only communicates about five at POP. Detailed information and progress reports on all 100 commitments are found on the program’s website. Engaging consumers to reduce impact — During an analysis to determine the total carbon dioxide (CO2) emissions caused by the production, transport and use of its shampoos, Boots, a UK-based retailer of consumer products (health and beauty), identified use as the major contributor to lifecycle emissions. They have launched a POP campaign to encourage consumers to wash their hair at a lower temperature, thus reducing emissions. Assuring sustainability claims — Timberland, a US-based manufacturer, marketer and retailer of footwear and apparel, has made public the methodology for their “Green Index Label”. Scores are assessed by Timberland’s Environmental Development Team and the approach is validated using an internal audit team and stakeholder engagement. Walmart has announced the development of a worldwide sustainable product index which will provide a “single source of data for evaluating the sustainability of products”. Sustainability information will be conveyed via a simple, consumer friendly and comparative rating scheme. Prior to making a purchase, a typical consumer first recognizes a need or dissatisfaction, gathers information about products that might fill this need, and then evaluates their choices. Communicating with the consumer about sustainability might encourage a consumer to realize their dissatisfaction with less sustainable alternatives, or help a consumer make a choice between products with similar purposes. A wide range of media can be used in various combinations to communicate with consumers about sustainability at POP. Media used by study participants include: labeling, packaging, posters, displays, staff interactions, and catalogues. Leading companies are responding to consumer demands for sustainable products and for more information about these products. As they do so, they are recognizing the positive benefits associated with sustainability communication. They also recognize that for communication to be effectively delivered and corporate benefits maximized, business objectives for sustainability communication at POP must be set. By communicating its products’ sustainable attributes, Aveda, a US-based global manufacturer and retailer of consumer products (beauty), is able to enhance its brand image associated with natural and organic products. As a provider of pharmaceutical products, corporate trust is fundamental to Boots, a UK-based retailer of consumer products (health and beauty). Communication on sustainability efforts builds that trust. Creating enduring relationships by engaging consumers in sustainable change. When M&S, a UK-based retailer of consumer products (apparel and food), offered five pound coupons to consumers who recycled clothing with OXFAM, a non-profit organization who re-distributed the clothing to the needy, the redemption rate was significantly higher than when similar coupons were just mailed to consumers. MEC, a Canadian retailer of apparel and sporting equipment, developed a sustainability logo to inform consumers of sustainable product attributes. 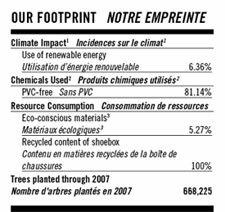 Canadian Tire, a consumer products retailer, reports that sales of its Blue Planet “environmentally preferred” product line are better than standard product lines. Boots, a UK-based retailer of consumer products (health and beauty), worked with Carbon Trust to assess the total carbon dioxide (CO2) emissions caused by the production, transport and use (carbon footprint) of shampoos, revealing areas for operational improvements across similar products. Aveda built a campaign promoting the sustainable use of water to complement society’s growing understanding and appreciation of our limited water resources. P&G, a US-based manufacturer and marketer of consumer products (personal care and household), conducted a lifecycle analysis and found that use of laundry detergent has the greatest energy impact of all its products, and so created Tide Cold Water. Over the past ten years, Canadian Tire, a consumer products retailer, has seen growing public and consumer interest in “environmentally preferred product options and considers both understanding and acting on this interest as critical for business success. Additionally, given the association of trust with the Canadian Tire brand, consumers expect the company to “do the right thing” and sustainability activities are pivotal in building long-term consumer relationships. Active POP communication about sustainability reinforces this trust, meets consumer needs, and increases sales. In fact, the Blue Planet line is achieving sales growth that is greater than average when compared to other Canadian Tire product lines. Making decisions about which issues to communicate is fundamental to sustainability communication at POP. Participant companies agree that such decisions should be connected to corporate brand, business strategy and business opportunities, and should not be viewed as a public relations exercise. Participant companies determining which issues to communicate at POP. Timberland, a US-based manufacturer, marketer and retailer of footwear and apparel, focuses on strategic performance areas identified by a board committee and through external stakeholder engagement for POP sustainability communication. M&S, a UK-based retailer of consumer products (apparel and food), used a lifecycle analysis to identify areas of greatest value chain impact and areas where consumers could take action. Canadian Tire, a consumer products retailer, used market research to identify carbon management as the area on which consumers were most interested in receiving information / taking action. Aveda, a US-based global manufacturer and retailer of consumer products (beauty), often links its communication messaging to areas in which consumers are likely to take action to (e.g. using renewable energy). Number of trees planted by the company in a given year. While companies vary in their approach to communicating about sustainability, the elements presented in the checklist below are consistent across study participants. Study participants use different media to communicate sustainability information at POP. Some of the common approaches used include: labeling, packaging, posters, displays, staff interactions, and catalogues. All study participants used at least two of these media in their communication approach. The tone of sustainability messaging should also resonate with corporate brand, and be consistent with corporate strategy and sustainability performance targets. Maintaining coherence between communication channels including television, radio, print and web-based media. The more consumers are engaged in sustainability initiatives, the greater the sustainability impact and corporate returns in terms of brand value and consumer retention. Look for opportunities to engage consumers directly in improving performance and create feedback loops to bring consumers back to products and stores. Avoiding the promotion of false or misleading information is critical to ensuring credibility. Strictly apply guidance such as Canadian Standard Association’s (CSA) “Plus 14021 “Environmental Claims: A guide for industry and advertisers”Footnote 1 and “Environmental Product Declaration according to ISO 14025”Footnote 2. Also consider using internal and / or external experts and third party auditors to verify statements. Communication on sustainability is most effective and credible when approached from a platform of strong operational and product sustainability performance. This ensures that a company does not engage in risky “green-washing”Footnote 3. Companies should define a sustainability action plan to identify and drive performance improvements and consider action around technical fixes, product sustainability improvements, supply chain partners and consumer impacts. Understanding and monitoring the success of communication activities (e.g. through metrics like sales, greenhouse gas emission reductions, and consumer participation rates). MEC, a Canadian retailer of apparel and sporting equipment, applies a sustainability logo to products that contain organically grown cotton, recycled polyester, or are completely PVC-free. Signage throughout retail space guides consumers on a tour highlighting sustainable design features (e.g. solar panels, environmentally preferable construction materials, etc). MEC-brand products are packaged using low material volumes and recycled content whenever possible. The MEC catalogue, (available in-store) delivers sustainability messages (e.g. 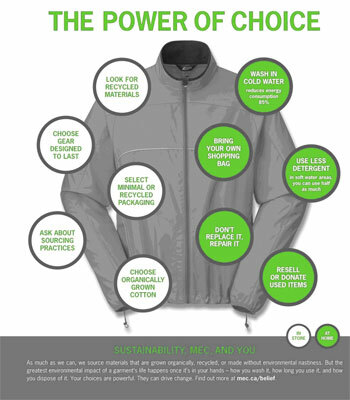 a two-page spread called “The Power of Choice ”, highlights ways in which MEC and its consumers can make a positive impact on the environment). “The act of misleading consumers regarding the environmental practices of a company or the environmental benefits of a product or service”. TerraChoice. The Seven Sins of Greenwashing. April 2009.